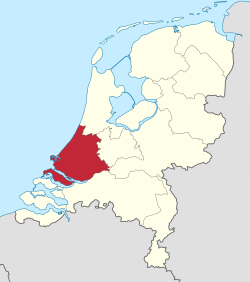 Sooth Holland (Dutch: Zuid-Holland [ˈzœy̆t ˈɦɔlɐnt] ( listen) is a province situatit on the North Sea in the wastren pairt o the Netherlands. The provincial caipital is The Hague an its lairgest ceety is Rotterdam. Sooth Holland is ane o the maist densely populatit an industrialised auries in the warld. Wi a population o 3,502,595 (30 November 2009) an an aurie o 3,403 km², the province haes the heichest population density in the Netherlands. Sooth Holland is dividit intae 60 municipalities. In the Netherlands a municipality (gemeente) mey consist o a single ceety or toun or it mey consist o a number o smawer touns an veelages. This page wis last eeditit on 23 August 2018, at 15:56.